Rotating pinwheel attached to handle. Use the pinwheel to elicit cutaneous sensory and pain perception responses. The Baseline® Cleanwheel is a disposable neurological pinwheel that tests for nerve damage. The Cleanwheel measures the sensory response of the skin's surface with the rotating pinwheel that is attached to the handle. It is contained in sterile packaging to be hygienic for each patient. Dimensions: 6.5" x 0.2" x 0.5"
The Baseline® Cleanwheel is a disposable neurological pinwheel that tests for nerve damage. The Cleanwheel measures the sensory response of the skin's surface with the rotating pinwheel that is attached to the handle. It is contained in sterile packaging to be hygienic for each patient. Pack of 25. The Baseline® Cleanwheel is a disposable neurological pinwheel that tests for nerve damage. The Cleanwheel measures the sensory response of the skin's surface with the rotating pinwheel that is attached to the handle. This pinwheel is contained in regular packaging and can be disposed of easily. Consists of rotating pinwheel attached to handle. Use the pinwheel to elicit cutaneous sensory and pain perception responses. Dimensions: 7.25" x 0.2" x 1.5"
Use the pinwheel to elicit cutaneous sensory and pain perception responses. Disposable sterile unit made of plastic. Neuro-Aide neurological pinwheel consists of a rotating pinwheel attached to a handle. Used by orthopedists, neurologists, neurosurgeons, and other physicians to test a patient's ability to feel sharp contact with the skin. One can test for nerve damage, or nerve dysfunction. Made of plastic. 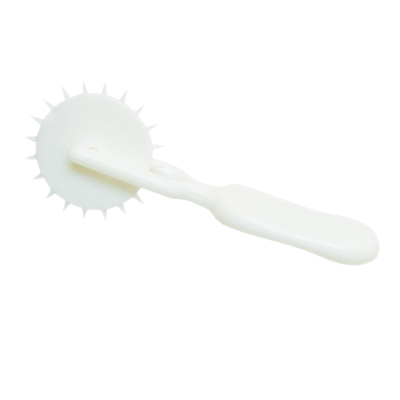 Dimensions: 3" x 1" x 1"
Use the Wartenberg Neurological Pinwheel to elicit cutaneous sensory and pain perception responses. 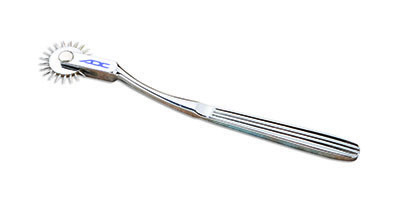 It features a rotating spur and a handle with textured grip. The overall length is 7 ½ inches and is not made with natural rubber latex. Dimensions: 8.38" x 0.25" x 1.63"